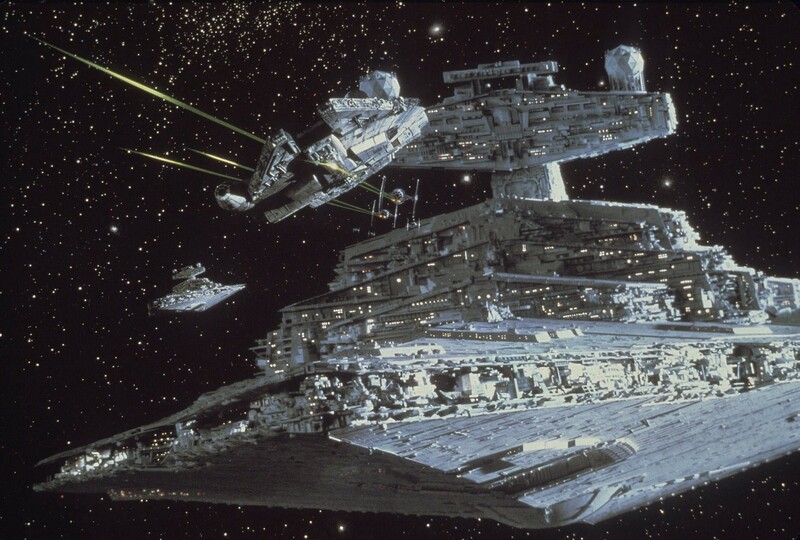 One of the many miniatures Richard Edlund and the ILM crew shot for the original “Star Wars” trilogy. The wildly creative mind behind the eye-popping effects of many blockbuster films has a secret office in Los Angeles. At first glance, you’ll spy a “Ghostbusters” coffee table book, and over there are framed posters of movies he helped make. Behind him is the Pignose portable guitar amp he created. And on a crowded bookshelf flanked by BAFTA and Academy Sci-Tech awards are his Oscars. 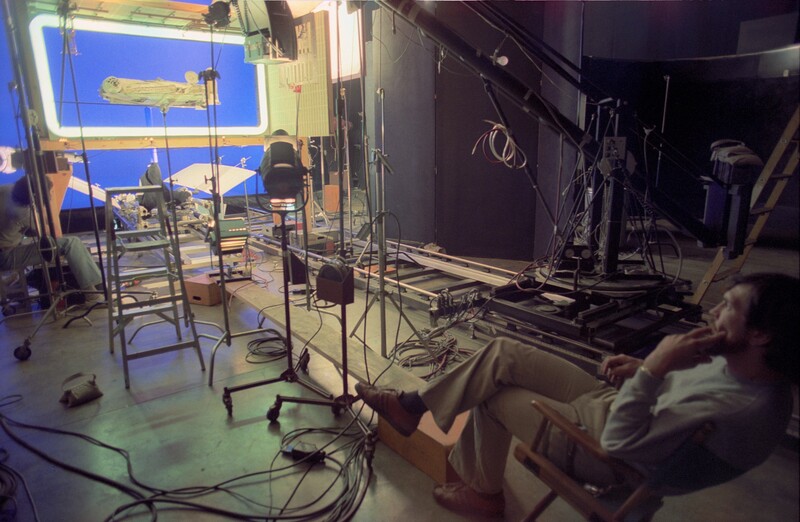 Richard Edlund’s accomplishments seem as unbelievable as his visual effects. Shortly after graduating from USC in the ’60s, he shot the opening flyby of the USS Enterprise for the original “Star Trek” TV series. After years of working on commercials in the ’70s, John Dykstra, the visual effects supervisor for “Star Wars” (1977), tapped Edlund to be his first camera operator. Dykstra, Edlund and other trailblazers formed the legendary visual effects company Industrial Light & Magic (ILM) in Van Nuys, California, while making miniature ships fly through space for “Star Wars.” The duo would win their first Oscars for their effects on the film. The pair would go on to work on the original “Battlestar Galactica” TV series in 1978, but when it was time to begin “The Empire Strikes Back” (1980), George Lucas chose Edlund to supervise the visual effects. 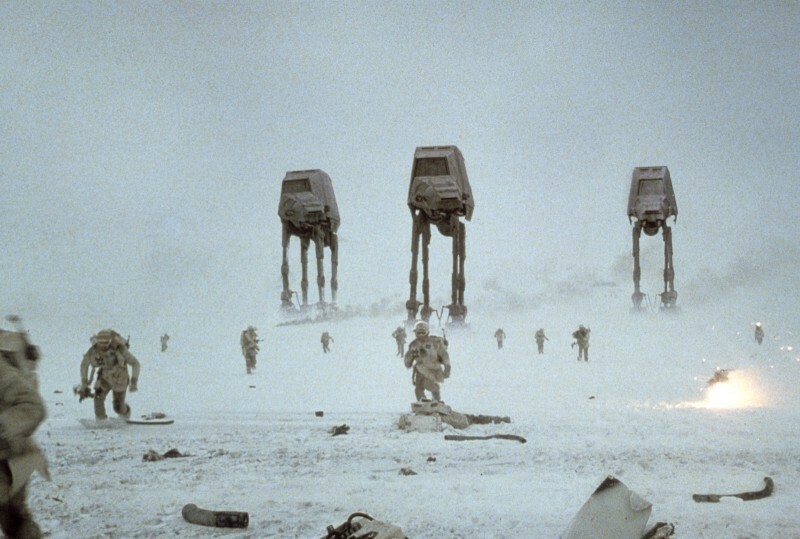 Edlund’s remarkable ability to film Luke Skywalker’s X-wing tripping up the AT-AT Walkers in “Empire” was one of the many feats in the movie that helped earn him his second Oscar. His success with “Empire,” notably his knack for evoking the white, snowy environs of Hoth, would open the door to wielding his magic on “Return of the Jedi,” “Poltergeist,” “Raiders of the Lost Ark,” “Die Hard,” “Ghostbusters,” “Fright Night,” “Air Force One” and many other films that shaped generations. On a rainy morning, the longtime Academy member and current Academy Governor discussed the first two “Star Wars” films. Below, in bold, are facts learned in an hour-long conversation, followed by Edlund’s comments. The original “Star Wars” had a limited effects budget. We created all the effects — 365 shots in “Star Wars” — in two years for about $2.5 million. That was our budget. And that included building the optical department. We got a fantastic deal from Howard Anderson, who had an optical company on the Paramount lot, and sold us the VistaVision equipment that had been built up and amassed by Paramount. We bought what we called the Anderson printer for $14,000. It was a two-headed printer with a camera, a complete optical system, a lamp house and everything built in. Edlund had his doubts about “Star Wars” until they hired for the role of Obi-Wan. 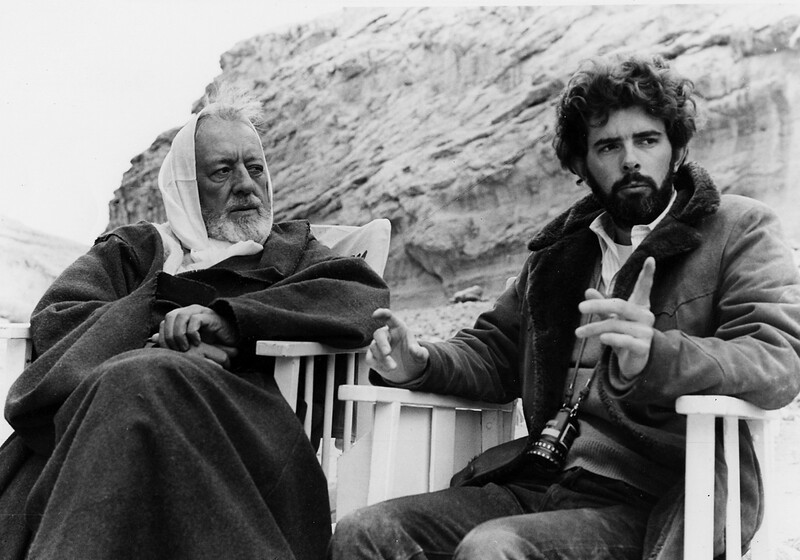 Alec Guinness and George Lucas on the set of “Star Wars” (1977). I was a little worried about the script because of the “Trust in the Force, Luke” line. It would have to be Marlon Brando or somebody like that. But, when George [Lucas] cast Alec Guinness [as Obi-Wan Kenobi], I figured, it’s a blockbuster. I knew that it was going to be a hit. In my soul. I was worried that it was going to be a teenage movie, but Alec Guinness had the gravitas for that part. He basically transcended the teenage demographic. 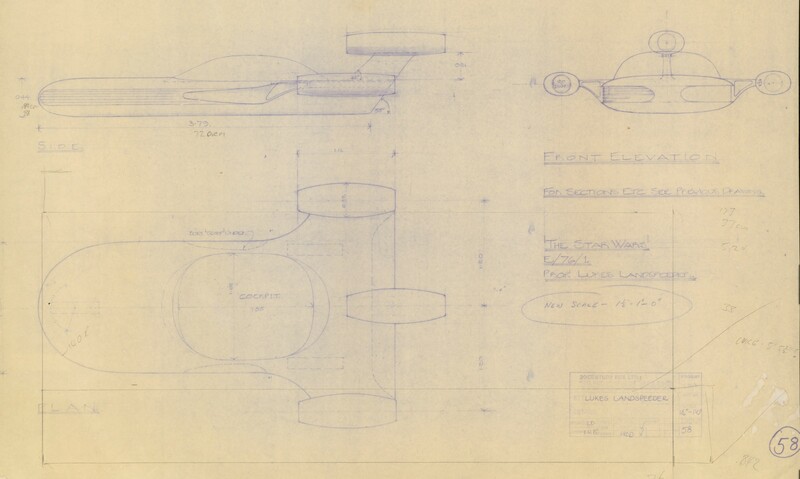 George Lucas based the space battles on real ones from WWII. George had cut a 10-minute reel of 16mm footage that he had gotten from “Battle of Britain” (1969) and other World War II dogfight movies. We understood the cutting dynamic that he had in mind from this reel. For example, a B-25 became a Millennium Falcon and a Spitfire became the X-Wing. Although Edlund thought about light (like the two suns in the Tatooine sky), he cared more about people being lit well as opposed to being lit realistically. R2-D2 accepts an important message from Princess Leia in “Star Wars” (1977). My attitude was every shot of the X-Wing is gonna be lit to make it look as good as it can look. And that means they are virtually always back lit. At one point John did this construct of the galaxy and where the sun was and how each shot would be lit by this sun that would be here. And I said, “John.” I said, “Do you remember, you’ve seen all those great movies in the ’30s and ’40s and ’50s and the actors always looks great in every shot.” It’s like, they’re not paying attention. They’re all using Rembrandt lighting, which is like, it’s like here. And so half the face falls in shadow. And so I said, “I’m gonna light every shot to look the best it can and nobody’s gonna give a damn. Because it’s a fantasy.” So his whole concept of the lighting schedule went out the window. In between “Star Wars” and “The Empire Strikes Back,” ILM went by the codename Kerner Company. Because “Star Wars” was such a monstrous hit, we had to go underground as the Kerner Company. All purchase orders were made under the Kerner Company, inspired by Kerner Avenue in San Rafael. Otherwise, we’d have all these fans scouring through the trash. I mean, we had people begging for model shop sweepings. We had to protect ourselves from that. Carrie Fisher and Mark Hamill in “Return of the Jedi” (1983). 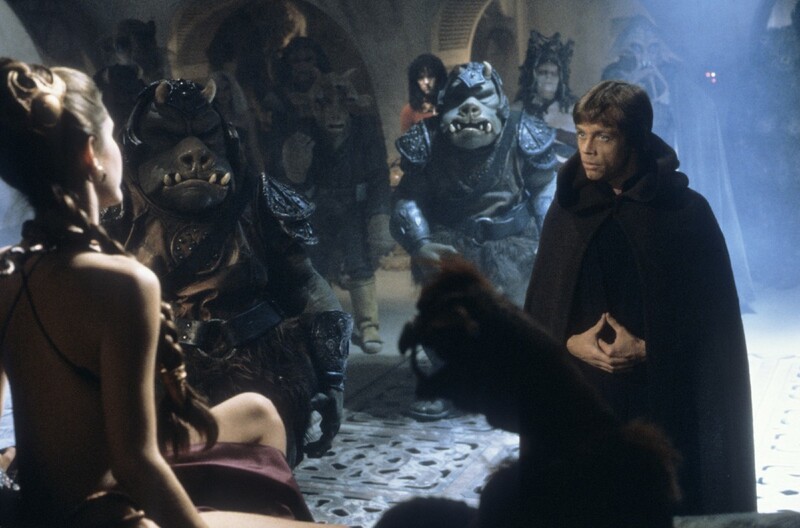 Since the Kerner Company ruse worked so well, on the set of “Return of the Jedi,” the crew tried to throw off fans once more. On “Jedi,” when we were shooting the Sarlacc Pit and Jabba’s barge in Yuma, Arizona, they built this enormous, 40-foot structure out of telephone poles. On top of it, there was a big dish with an edge that would blend with the dunes in the distance. The idea was that we could shoot this whole scene and not worry about the thousand dune buggies that were swarming around down under the base. 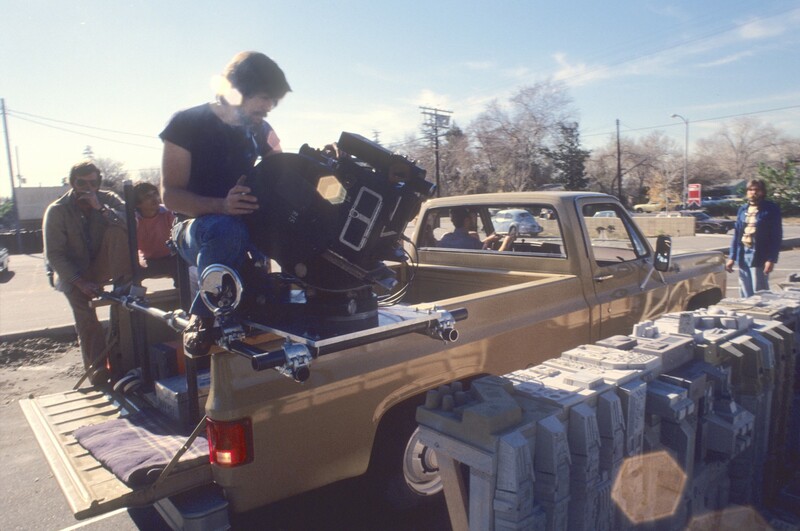 It worked until one day you could see 3P0 and R2 in a pick-up truck on the way to the set. John Dykstra used his Dykstraflex camera on “Star Wars,” but for “The Empire Strikes Back,” Richard Edlund devised his own motion-controlled camera. The Vista Cruiser was a much more sophisticated camera and it had much better movement. The logo was swiped from a Buick station wagon. It wouldn’t run at any speed other than one frame a second. When you’re moving something with that much mass, you can’t move it fast because then you have frame rate issues. The whole idea was all of these shots were programmed at 1/24th of actual speed, so you had to think in slow motion. The toughest sequence for Edlund in “Star Wars” wasn’t a fighting scene. The hardest shot was the shot of the Millennium Falcon coming into the docking bay. The lightsaber effect wasn’t very easy to achieve. It was producer Gary Kurtz’s idea to use front projection material on a stick, have a beam splitter on the front of the camera and reflect light off the beam splitter towards the front projection material. That brings light back very brightly to the camera. It was a good idea on side shots, but when it starts getting into this angle, the effect goes away because it has to be almost plane to the camera. So it was very limiting in terms of what you could do. 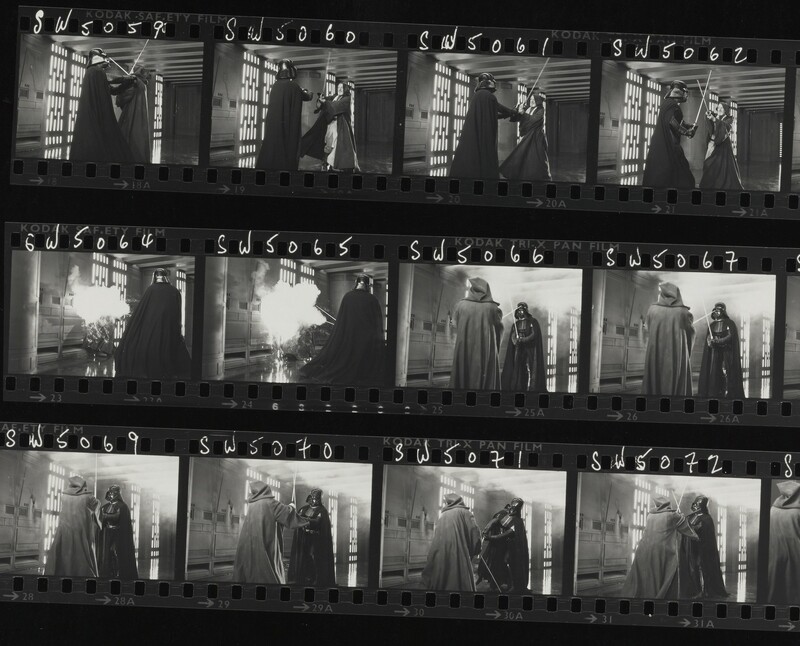 A contact sheet of Obi-Wan dueling with Darth Vader in “Star Wars” (1977). What worked was far simpler in practice. Basically, they fought with sticks, and each shot had to then be rotoscoped. So all of the light sabers in [the original] Star Wars [trilogy] were rotoscoped. They were animated. On “Star Wars,” the shots were mainly of spaceships against star fields. It’s pretty easy to get a matte for that, and it’s easy to fix a matte. On the other hand, on “Empire” we had light gray ships zooming around with motion blur, with blurred engines, against a snow scene, or a white sky, or a sky with puffy white clouds. Any matte lines would give it away and it wouldn’t work. Visually, we had to conquer the matte line, and we did that with a Quad printer. Using a Quad printer is complicated photographically. In other words, one of the mattes had to hold up the motion blur. However, that matte wasn’t heavy enough to hold a ship out against the background, so I had to use two. I had to have the motion blur matte, which took care of the edges, and then I made another mat that was shrunken in size. You could do that through exposure. That combination made it possible for us to do that whole speeder chase scene and fly around the walkers. For the most part, the stop-motion walkers were shot on sets with 20-foot-wide panes of the sky, using wedding veils to give an atmospheric quality to the distance. He said, “I couldn’t let the movie go out with that like that.” It’s the one with the puddle that was under the ship. But Edlund loves the look of the Special Edition films. It looks so fantastic. First of all, you have to understand that in the photochemical era, all of the shots are a dupe. When you go to the theater, you see it’s all been duped, and so there’s a notable drop in quality. Not only a little bit, but a lot in some cases. 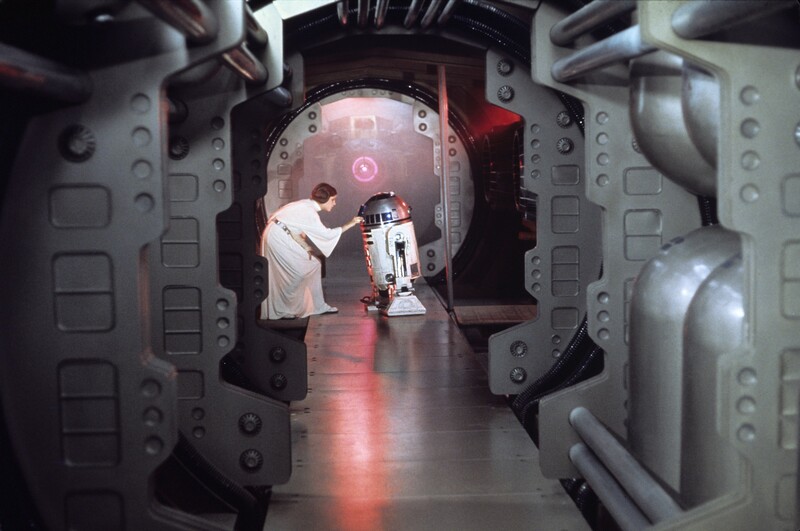 When I saw the digital restoration of “Star Wars,” it was like seeing the whole movie as a first-generation print because they were able to clean it up. 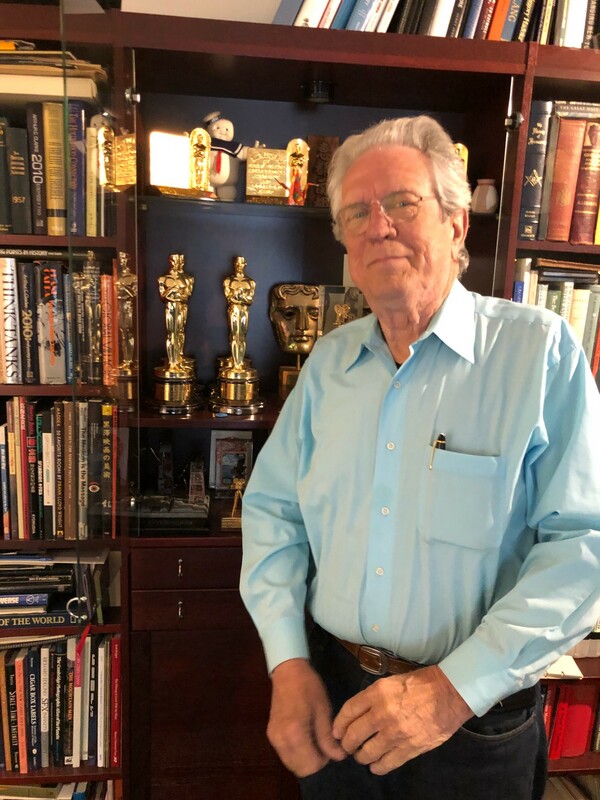 Richard Edlund in front of a few of his awards in 2018. This interview was conducted, edited and condensed for space by Academy staffer Tony Pierce.